The products we use on your dogs are always non-toxic, environmentally friendly, and organic, when possible. 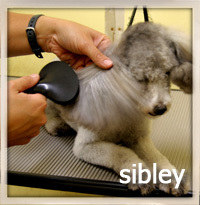 After being brushed and de-matted all pets receive at least two baths. An itch-relieving, ultra-soothing Oatmeal bath is available for an extra fee. If the pet does have fleas we use a non-toxic flea soap for the second bath. If the fleas are prolific we apply an herb based flea dip before the bathing begins. 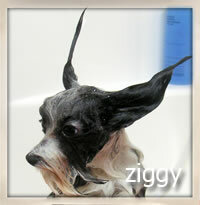 Many dogs have allergies and have been prescribed a medicated shampoo. We encourage you to bring this in with your pet and we will use it as the final bath. After the bath a high velocity dryer is used in the tub to force shedding hair and water from the coat. Then your pet is placed on a clean towel, in a crate, with a heat-less fan, to relax and begin to dry. 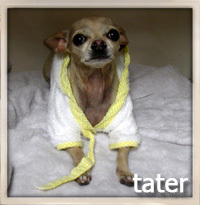 If your dog is petite, or frightened, we simply towel them off before letting them rest. Soon the dogs are taken to be blown dry by hand. At the outset another high velocity dryer may be used, to facilitate the drying process, especially on thick and double-coated breeds, but the session always culminates in the dog being brushed out under the warm air of a stand – dryer until it is fluffy and dry. Then it’s back to another clean towel to lounge and wait to be finished. At this point we begin our mid-day walking, which allows the dogs a chance to relieve themselves, get a drink of water, and check out the outdoors. They really enjoy “reading the newspaper” left by previous dogs! As your dogs are being finished they have their toe-nails clipped and ears cleaned again. We offer a grinding service for an extra fee of $8.00. This removes any rough edges that may be left by the clipper.